On the first day of 2019, instead of looking back over just the past 12 months, I am going to look back ten years. There’s an African proverb which says if you don’t know where you’re coming from, then you don’t know where you’re going. 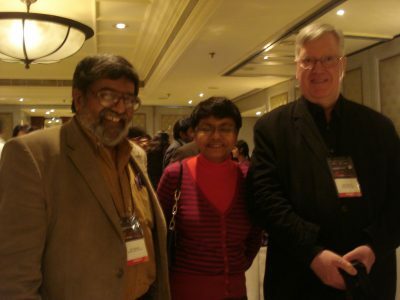 The photograph above was taken towards the end of 2009, at a design event in New Delhi, India. Its the only one I have, so I’m using it here though its rather unclear and blurry. I am lucky to be standing between two giants in thinking about design, both of whom were my teachers, one each, in each graduate school of design I attended on two continents, in two different centuries. On the left, grinning through his beard, is the late MP Ranjan of the National Institute of Design, Ahmedabad, who was a legend in his own time. The system after all, remained at the heart of Ranjan’s design philosophy. People, processes, relationships and the environment unified into an ecology within which every design solution had to exist in harmony; there could be no product without a paradigm, and no concept without a context. On my right, is the late John Heskett, author of the book Industrial Design, and teacher of planning for design in a multidisciplinary way. Communicating clearly the value of design that designers can contribute to any organization is a continuous challenge. Understanding economic theory as it shapes business attitudes and conversely, how design can shape economic value, can be a valuable means of integrating design into business thinking. As I reflect upon my own work, in thinking and writing about design, as well my design practice, I can see how each of these forward looking thinkers and teachers shaped my approach and methodology for problem solving in conditions of uncertainty and adversity. Ranjan’s hands on systems approach to design blends well with John’s lenses of economics and business, particularly strategy and policy, together offer a powerful framework for undertanding the complex adaptive systems within which interventions and innovations are intended to be introduced. Heskett once said, in class, that an invention wasn’t an innovation until it was adopted by the end users, thus gaining the critical mass necessary for transformation, an inherent quality of innovation. While Ranjan never failed to remind us of the people involved – in both creating new design solutions, and embracing them – when we undertook to intervene. John taught me Design Policy and the impact of Market Forces on Design Planning. Ranjan introduced the fundamental methodology of the design process and systems thinking. If I am, today, finally comfortable with labeling what it is I do as design, it is because of having had both of them in my life.